ABC alphabet letter charts to print. Printable letter charts with the full alphabet letter set A to Z in PDF. Prints perfectly on an A4 size paper. Download our alphabet charts for free now. If you're looking for quality Alphabet letter charts in PDF format. You can download and print them below. We have alphabet letter charts available in 4 color themes. Blue, Green, Orange and Red color charts. Print them below for free! These letters are printed in a bubble cloudy theme. Instructions: To print our free alphabet letter charts, please click on the link below the letter chart below. You can download the pdf file which will appear in the new window, or print the chart from your web browser. These Alphabet letter charts have been created for you for free so please enjoy! Thank you for viewing our alphabet letter charts. We also have a selection of number charts too. Please check them out! Alphabet letters and numbers are important for each child to learn. 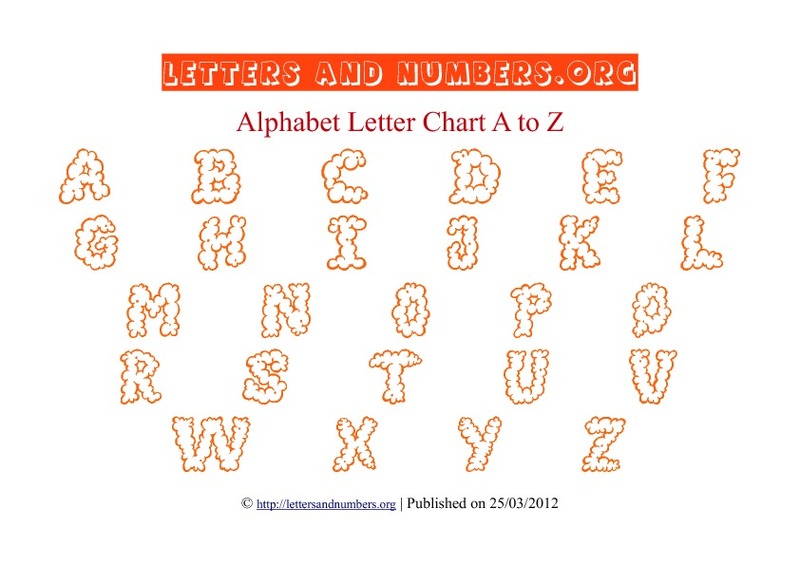 Provide your kids and students with our free alphabet letter and number charts. Please check back on a regular basis for more new printable charts, activity worksheets, alphabet quiz games and much more.